So I had a chance to go to Universal Studios last night and attend a screening of FIRST MAN, starring Ryan Gosling and Claire Foy. 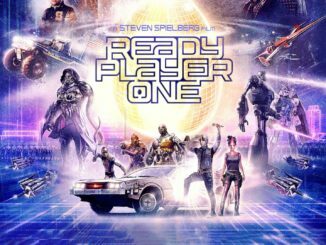 Taking place at the height of the Space Race, the film is based on the best seller by James R Hansen and directed by Damien Chazelle (La La Land). FIRST MAN tells the true story of the first man to walk on the moon, Astronaut Neil Armstrong, and how the dangers of space exploration affects him and his family life. But while the film’s space mission scenes grab you and don’t let go, the in between scenes that detail the life of a true American hero tend to wade into the melodramatic. The film gets off to a roaring start as viewers are put into the pilot seat of Armstrong’s X15 flight when he was a test pilot for NASA. The flight is almost a disaster as Armstrong struggles to get the rocket plane to descend for an unpowered landing. It’s an e-ticket ride to be sure, and is a portent of even more frightening space experiences to come. And then, right after, you find out that Armstrong is distracted by the suffering of his young daughter who has brain cancer. 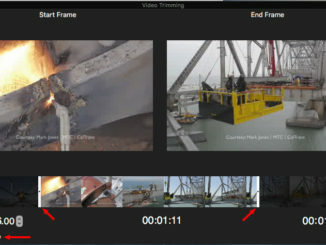 It’s heart breaking as Armstrong desperately tries to use an engineer’s approach to solve the problem, while seeing his frightened daughter slip away. It’s a losing battle on both ends, and Gosling does a pretty good job of letting the devastating emotions just bubble to the surface, as he struggles to push them down. But from there, we get the scenes depicting Armstrong’s near death during Gemini 8, and his crashing of a training vehicle, again, which Chazelle puts us in a first person point of view on. And they are as thrilling as they are terrifying for the average viewer who isn’t obsessed with space exploration. But none is so frightening as when the film shows the events of the Apollo 1 fire. Space is hard, and dangerous. 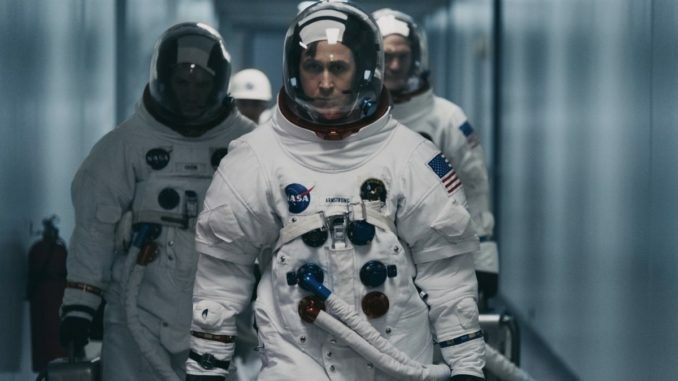 Chazelle does a brilliant job depicting these events, while weaving in the battles that NASA has to fight to keep funding going in the middle of growing political and civic unrest during the Vietnam war and politicians and press who question if the space race is worth the huge amounts of money and lives it is costing. Even the NASA brass begin to question it, when Armstrong nearly escapes death during training. “We have to fail down here,” Gosling preaches, “so we don’t fail up there.” It’s a stirring speech. I especially liked the moments when Armstrong quietly rebukes Buzz Aldrin. He puts him in his place with a few devastating, yet quiet words that Gosling delivers like a knife to the heart. 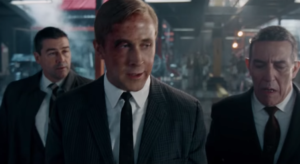 Unfortunately, those moments in Gosling’s performance are short lived, as the actor spends most of the time being remote and aloof, staring off into literal space, not really wanting to acknowledge the characters around him, being alone in his thoughts. This may have been an actual portrayal of Neil Armstrong the man, but in a movie, it gets a bit dull and tiresome. There’s a telling scene when Gosling’s character leaves an astronaut funeral, leaving his wife Jan (played by Foy) having to get a ride from a fellow astronaut. She mentions that Neil hasn’t spoken of the death of their daughter at all, and it’s plain to see that the life of an astronaut has taken its toll on their family life, leaving her to cope albeit alone with two kids, and grieving friends as they lose their husbands to this dangerous business. Armstrong even loses his best friend Ed White in the Apollo 1 fire, and has to cope with that, while preparing for his own mission. And on the eve of Armstrong’s history making odyssey, Neil’s wife Jan finally puts her foot down. 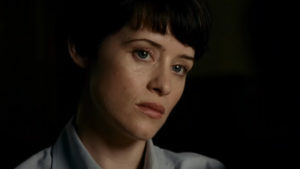 It’s Clare Foy‘s best moment. 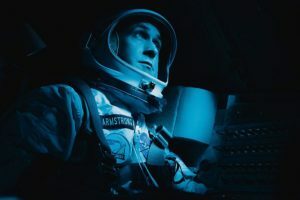 FIRST MAN struggles, however, with the same shortcoming that every bio pic does … the need to time jump to major events in the subject’s life, so the story ends up being disjointed. But it will be one of those movies that space geeks will love, as it immerses them into the “Space Race” and the consequences of it. Consequently, they will also be driven crazy over this film, with a few gaffes that only us NASA fans will notice. But that’s OK. Every space movie has them. Other fans, will find this depiction of the life of Neil Armstrong to be compelling, but maybe a bit melodramatic in between the action scenes. I honestly think the film is better directed, than it is acted or written. But I am forced to admit I may be alone in that assessment. 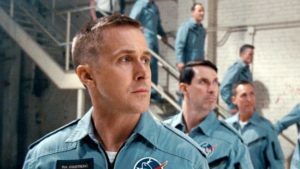 FIRST MAN is distributed by Universal Pictures.